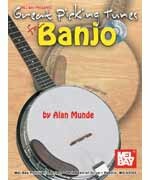 Long-time banjo picking ace Alan Munde brings his considerable banjo arranging skills to some of the most played sons in the bluegrass tradition. In these stylistic revealing arrangements, running from straightforward roll approach to the delicately beautiful melodic fingerings, Munde lets the melody of each piece stand out to its fullest. Great Picking Tunes for Banjo includes all-time winners Red Wing, Turkey in the Straw, Arkansas Traveler, Down Yonder, and Home Sweet Home, bluegrass favorites Blackberry Blossom, Cumberland Gap, Black Mountain Rag, John Hardy, and Bury Me Beneath the Willow, fiddle favorites Whiskey Before Breakfast, Flop-Eared Mule, Boston Boy, St. Anne's Reel, and 8th of January, plus a host of other jam session standards.